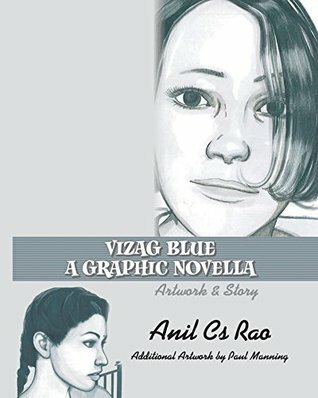 REVIEW- Vizag Blue is a Graphic Novel written by Anil C. S. Rao. First of all, i'd like to Congratulate him for writing a Graphic book which indian authors hestitate to hassle with. Story of our book revolves around Kalpana, who stops speaking with anyone. Her Doctor send her to her beach house with Usha, her nurse. Usha tries hard to break the bubble with Kalpana but to no avail. One day she finds Kalpana, naked on the beach. How did she reach there? Why had Kalpana stopped talking? To get these answers you will have to read this book. Author has tried to serve a psychological thriller which he does beautifully but fails to present it. Characters and Storyline seem scattered and needs retouch. Storyline fails to hold the readers. Ending is written very hurriedly. Cover is beautiful and attracts the readers. Title is appropriate and catchy. Altogether, Vizag Blue is a beautiful attempt by Mr. Rao but failed to handle it properly.